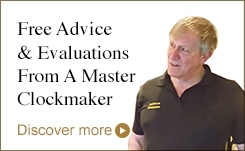 the website of Master Clockmaker Mark Taylor. Setting the standard since 1987. 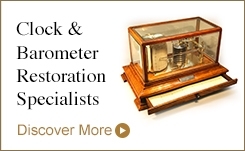 WE ARE THE LEADING CLOCK & BAROMETER RESTORATION SPECIALIST. 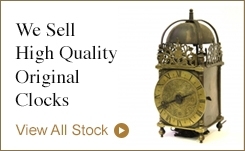 WE ALSO OFFER A WIDE SELECTION OF FINE AND ORIGINAL ANTIQUE CLOCKS FOR SALE. 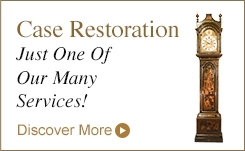 If you have a clock or barometer that needs attention then contact us for a friendly and personal service, we specialise in all aspects of mechanical clock repair and restoration and all work is carried out by us - NOTHING is sent away. We advise and evaluate your items free of charge to help you choose whatever course of action is best for you, guiding you through the whole process. We can collect and deliver your clocks and someone is always on hand to help you bring it in from your car if you can get it to us. Ask us anything - we'll explain whatever you need to know in plain English. All work carries a full guarantee and we have a name that you can trust. Upon completion of work, your Specialist will explain all you need to know and we're always on hand to advise you by telephone or email - it's all part of our service. Complying with strict codes of ethics, we ensure that you receive a high quality of service and 'transparency'. Our business has grown on honesty, unbeatable knowledge and skill. Many of our customers have been using us for over 30 years. What's different about us? Nobody else can do what we do and we are probably the friendliest clock shop in the country! We also have a wonderful range of carefully selected clocks for sale. Why buy from us? Because as Clockmakers, we have a unique insight into authenticity. Pricing our clocks as reasonably as possible, irrespective of the market value, we pride ourselves in giving an unbeatable service and value for money. If you want a fabulous antique clock that is competitively priced, guaranteed and authentic, pay us a visit. We can collect and return you from either Bournemouth Interchange (coach and train station) or Bournemouth Airport also, Pokesdown railway station is within walking distance to us. There's no obligation on your part as we prefer our customers to take time in deciding on purchases and repairs. You'll be made to feel welcome and offered refreshments. 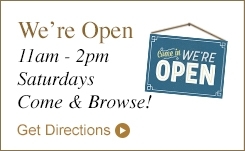 Open 9am - 5pm Monday to Friday and 11am - 2pm on Saturdays, you're welcome to visit us and browse. We also collect and deliver items, please contact us for details. Below is a small selection of items for sale. To see more click on the 'STOCK' link at the top of the page.